Prior to arriving in New York City, my fourth visit in 4 years, I had done a significant amount of research on what new restaurants were catching headlines and had already made reservations at all of my top picks. Although Marea wasn’t one of them, after only one day in Manhattan I realized that I'd had made a big mistake - everyone, and I mean everyone, was talking about Marea. With only two days notice and one incredibly lucky phone call, I found myself with a lunch reservation at New York’s hottest restaurant. The setting was exactly what you would expect of a celebrated Midtown restaurant located just across from Central Park: tables of businessmen in important looking suits alongside elegantly coiffed women donning pearls, over-sized rings, and classic Chanel jackets despite the summer heat. Combined with its spacious, open dining room, Marea is the cliché Big Apple business lunch destination: a place to see and be seen. Unfortunately, like most “business lunch” establishments, the grandeur of the atmosphere and crowd outweighed the grandeur of the food, surprising seeing as how even the Times’ food critic had nothing but glowing things to say about Marea. And to top it off, we even ordered the exact dishes that were being praised by food journalists and NYC locals alike! 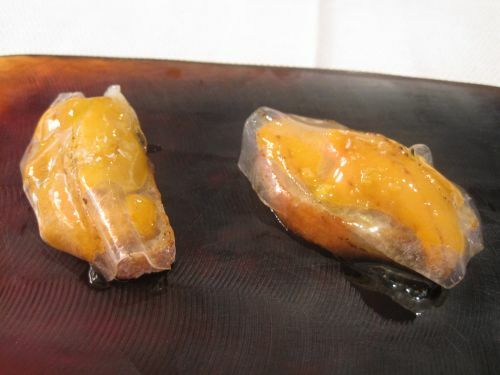 Our first small bite, the Sea Urchin paired with lard and sea salt, was plain in presentation, uninspired in flavor, and simply fell flat. 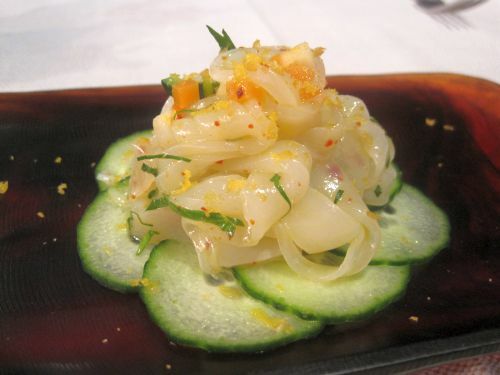 Similarly, the Seppia that followed – Cuttlefish cut to resemble tagliatelle, soffritto crudo (raw veggie sauté), and bottarga di muggine (grated grey mullet roe) – was one-dimensional, lacked adequate seasoning, and was equally disappointing. Despite the lackluster appetizers, the most-hyped dish on the menu and the one I was most excited to try was still to come. 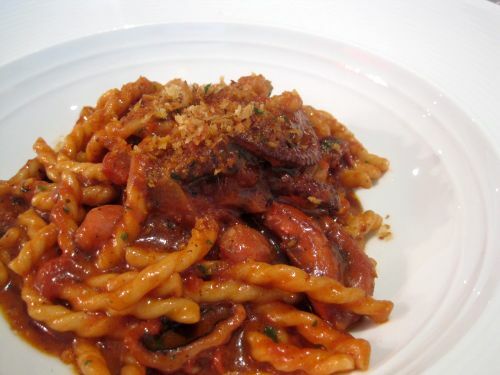 My mouth instantly began to water when the Fusilli with red wine braised octopus and bone marrow, coated in an elegant, deeply-colored Sangiovese wine sauce, was placed in front of me. Little fault could be found in this dish: the pasta was perfectly cooked, the braised octopus was beautifully tender, and the sauce was full-flavored and rich. Despite its perfect execution and flawless composition, it just wasn’t especially compelling; I’ve simply had better pasta at numerous other establishments. Surprisingly, it was the dry aged Sirloin that stole the show: a flavorful, perfectly cooked piece of meat that literally melted in your mouth. 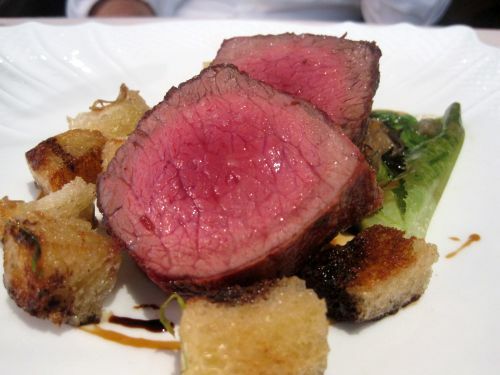 Finally, I understood the appeal behind the classic, business-lunch power-steak. Overall, I left feeling underwhelmed and slightly bitter by having been misled by public opinion. Sure, I went for lunch rather than the more decadent evening tasting menu. And yeah, at a restaurant where it probably pays to be somebody, I was a big nobody. But no matter. For a restaurant to be awarded a Michelin star and a three-star New York Times review, I would expect higher quality cuisine no matter what the time, or who the clientele happens to be. It was for that exact reason that I canceled my plans to splurge on the tasting menu at Alto, Marea’s 2-Michelin starred sister restaurant, and instead opted to indulge at a restaurant that had, just the day before, blown me away with the best lunch I’d ever experienced: Eleven Madison Park. And if my write-up of that night is any indication, it was clearly the best decision I’ve ever made.